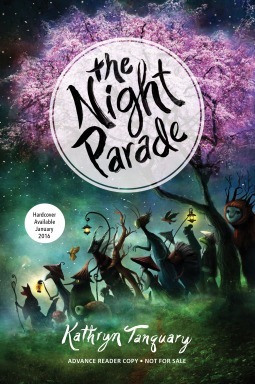 The Night Parade was a fun and enjoyable story. The first few chapters were a bit slow and made it a bit hard to get into the story as most of those take place in the real world and the main character Saki isn’t too likeable, especially at first. But once the curse is set and Saki enters the night parade I really enjoyed this book. Saki is a young girl who has to visit her grandma during summer vacation. Saki is not happy and would much rather be in Tokyo with her friend, who don’t really seem nice to me, but hey what do I know. And she isn’t happy to spend her time with her grandma which she finds boring and every chance she has she’s off to check her phone for messages. And ugh it was a bit annoying, she didn’t even try to enjoy herself. I guess it was realistic, but it wasn’t fun to read about. Once Saki enters The Night Parade she changes a bit. She makes some mistakes and then later realizes that and set things right, which I thought was awesome. She still wasn’t my favourite character, but how she handled herself during the night parade and towards the end of the story certainly improved my opinion of her. There are a lot of eccentric spirits during the Night Parade, she meets a trickster fox with four tales, a tanuki and a tengu who guide her. She meets a snail who has lost her shell and gets involved in a gross bathroom issue. She meets ogre’s and item spirits. And they all had their own motivations and personality quirks. It was fun to see so many characters, although it could be a bit overwhelming at times as there were so many characters and most only played a small part. I especially liked her three guides as those played a larger part and we got a better feel for them. There are some characters who could’ve used a bit more depth, like her little brother. Who was a pretty cliché whiny brother who only wanted to play video games. There’s also a plot line involving her friend back in Tokyo, which never gets resolved, although I guess it was more about Saki her involvement with it all, it would’ve been interesting to hear what happened or how things would change when she got home. The Night Parade is filled with Japanese folklore and myths, lots of spirits are based on existing folklore creatures or yokai and it was very interesting to see the author her take of it. I think the concept of the night parade is also loosely based on a Japanese myth, but to me it felt that the take was original and there is some world building of the author her own doing as well. At times it could be a bit confusing with how the spirit world and the real world were intermingled or combined and where the one ended and the other began, but at the end things got a bit clearer and the rest is left in mystery, which was fine by me. To conclude: The Night Parade is a fun and enjoyable book filled with adventure and a young girl who has to lift a death curse. There are lots of quirky and eccentric characters who she meets along the way and I liked how all the spirits were based at least partly in Japanese folklore and mythology. I didn’t like Saki much at first and struggled a bit through the first few chapters, but she changes as the story continues and I started to like her more, I especially liked how she acted towards the end and she correct her mistakes and right her wrongs. All in all a fun and enjoyable story. Do you enjoy books inspired by mythology or folklore? And if yes whcih mythology or folklore are your favourite or a good book you read with this? I’ll definitely have to check this out! 🙂 Was this a YA book? I am also quite fond of asian settings and culture. It’s interesting to learn more about other countries and cultures. It was a fun book. I like it when characters start out a bit unlikable and then change and we get to like them a bit more. I like greek mythology in books and stories that I read. It did make it hard to get into the book at first due to her being a bit unlikeable, but I agree that i do aprpeciate the growht and change more thanks to that. I saw this a few weeks ago and immediately fell in love with the cover. Great review and now I want to pick it up when I have a chance. I have to admit the cover is half the reaosn I picked it up, it’s such a pretty cover and it totally fits the book. I got my copy from netgalley, it might still be up there. I hope you’ll enjoy it as well! Yes it is, luckily in this case the book is as good as the cover!